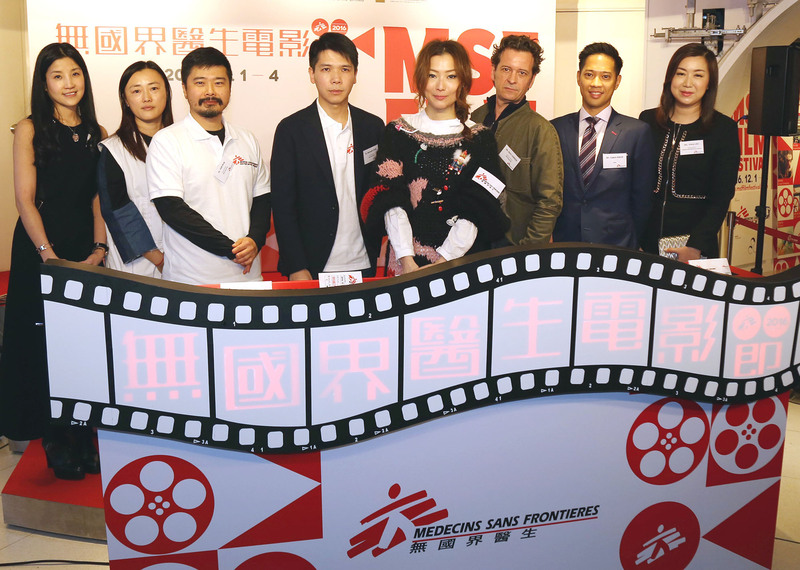 The opening ceremony of the first-ever Médecins Sans Frontières (MSF) Film Festival was held in The Grand Cinema at the Elements in Tsim Sha Tsui today. Celebrated singer and film actress Sammi Cheng, as the officiating guest, said she hopes that awareness of humanitarian work and crises would be raised through the five documentaries featured in the Film Festival. “The documentaries offer us not only a chance to see how medical care is offered in the midst of conflicts or epidemics, but also an opportunity to think about the meaning of humanitarian work,” said Sammi, who has herself starred in a number of films. “We are lucky to be living in a relatively stable city. We should think of ways to support the frontline work, so as to let the people who are devastated by natural disasters or wars get what they need.” Sammi continued by encouraging people to keep an eye on humanitarian crises that are happening in different parts of the world and to support the work of MSF, even if those supporters are unable to work themselves on the front line. Mr. Rémi Carrier, Executive Director of MSF-Hong Kong said, “Bearing witness at the front line is just as central to our work as providing medical care and we will speak out whenever necessary.” Rémi hoped that by organizing the Film Festival, the scenes, difficulties and challenges of frontline missions would help audiences grasp the reality of humanitarian work. He particularly mentioned the opening film Affliction as it brought audiences back to West Africa in 2014-15, examining how the Ebola outbreak exposed the unpreparedness of the international community to face an epidemic. He hoped that people who see the films will be even more likely to care about humanitarian issues and support the work of MSF. Officiating guests, including Sammi, inserted a replica movie ticket into a lightbox as sign of lifting the curtain on the start of the Film Festival. Apart from the opening film Affliction, the other four documentaries are about the difficulties and risks in the provision of medical care in war zones; the battle of AIDS patients in developing countries against the pharmaceutical giants and western governments to get life-saving medicines; the personal journey that field workers experience in the frontline projects; and the major humanitarian crises and the dilemmas for MSF since it was established over 40 years ago. Hong Kong people can find out more about the Film Festival through the event website (www.msffilmfestival.com). Movie tickets are on sale at Cityline. Ticket sales are used to support the MSF Film Festival event and MSF's relief work. Special thanks to the Film Sponsor CMG International Wealth Management Ltd; Festival Partners BRILLIANT INTERNATIONAL INC. LIMITED and Orient Securities International Holdings Limited; Supporting Companies Allen & Overy (Hong Kong), B&W Group Asia Ltd, Bodibra, Booming Import-Exports Limited, Digital Delta Investments Ltd, Holman Fenwick Willan, New World Construction Company Limited, Nicedrape Solar Protection System Co. Ltd, Pro-Tech Technology (Asia) Ltd, Regus, Schmoll Asia Pacific Ltd, Shu Kee Seafood Co Ltd, Sumeru Capital, Tan Tat Godown Company Limited, Unionwest Limited, Vegelink International Limited, Wealth Seafood Company Ltd and Yuk Ching Charity Trust.